Patients often wonder about why we recommend expensive treatments for teeth that don’t seem like they “need” it. Today was an excellent example of why our recommended treatment may change while we are working on a tooth, as well as why we say you need a crown when nothing really seems wrong. Lastly, it is one of the most powerful reasons why I use digital photography to document and educate patients, because when you can see for yourself, it’s a lot easier to understand. A Tooth with a Small Filling Suddenly Needs a Crown? Take a look at this tooth please, and what do you see? Probably just a small tooth-colored filling with some suspicious-looking grey areas on the sides, right? (click on it for a larger view). From the x-ray, I knew the greyish area on the left side was from a cavity. It didn’t look all that big, though, so I recommended a new tooth-colored (composite resin) filling – really not that big a deal. Once I took the old filling out, indeed we found some decay on that side of the tooth, but what worried me most is what you can clearly see in the picture – a crack running from one side to the other across the base of the tooth. 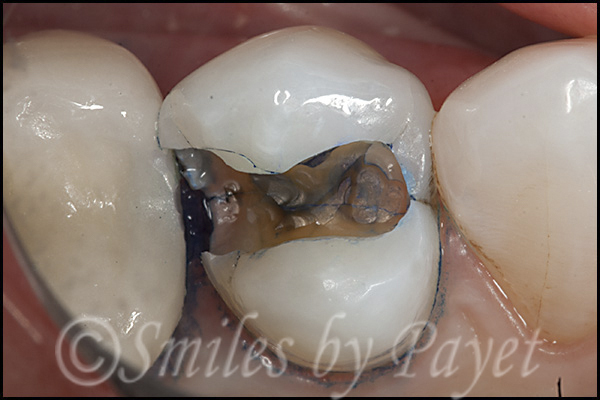 It is stained blue because of a dye we use to see the extent of a cavity or crack clearly – much easier to see for the patient. The patient told me she had not had any pain when biting, which is good, but kind of surprising. These upper teeth (premolars, which are behind the eye-teeth and in front of the molars) are the most likely to split all the way through, and if that happens, there is no way to save the tooth. The only way to save the tooth long term is to both bond it and to “wrap” it within a crown, which will keep the tooth from spreading further apart. Your next thought might be, “Why couldn’t you see the crack on the x-ray, Dr. Payet?” A very natural question, too. The answer is simple: unless a tooth is cracked so badly that pieces start separating, they are too narrow to show up or be visible to the human eye. Here is where we can really help patients, too, with our CEREC same-day porcelain crown system. We’d done several crowns for this patient 4-5 years ago, before we added CEREC technology to our office, so she had never experienced it. She was used to getting an impression/mold, a temporary crown, then coming back in a couple weeks to have the real crown bonded in. Today, however, after discussing the situation, we made her Emax porcelain crown and bonded it in before she left. Needless to say, she was very happy at not having a temporary crown, nor having to make a return trip and get numbed up again. 🙂 I forgot to download the finished pictures of the crown, but I’ll add those in the next 1-2 days.